James F. Aspell is the principal and managing attorney of the firm which he started in 2006 following 20 years of litigation practice in a mid-size firm in Farmington, Connecticut. Jim focuses his practice in the areas of personal injury and worker's compensation litigation, social security disability law, residential and multifamily real estate and personal bankruptcy. 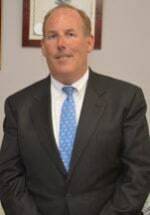 Recognized by judges and attorneys, Jim has been Peer Rated for his legal ability and ethics by Martindale Hubbell and has successfully brought and defended hundreds of cases at the trial and appellate level before the Connecticut Worker's Compensation Commission, and in Connecticut State , Federal and Mashantucket Pequot Tribal Courts. Mr. Aspell has been designated as one of only 52 Certified Connecticut Worker's Compensation Specialists by the Standing Committee on Specialty Certification of the Connecticut Bar Association. He has held the coveted Recommended Insurance Attorney by the A.M. Best Company since 2005 in recognition of his work in the defense of worker's compensation matters for various insurers, third party administrators and Connecticut municipalities. Jim was admitted to practice in the State and Federal Courts of Connecticut in 1986, The Mashantucket Tribal Court in 1991 and the United States Supreme Court in 1992. Jim is a 1986 graduate of Western New England College School of Law and a 1983 graduate of Ohio Wesleyan University. Mr. Aspell has served as an adjunct faculty member in the field of Aviation Law at the University of New Haven . He is a member of the Connecticut Bar Association and a member of the Worker's Compensation Section of the Association. Jim is also a member of the Hartford County Bar Association and has served for many years on the Legal Medical Committee. He is a member of the Connecticut Defense Lawyers Association, the National Association of Social Security Claimant's Representatives (NOSSCR) and the National Association of Consumer Bankruptcy Attorneys (NACBA). He is a past member of the Defense Research Institute. Jim is the President of the Connecticut River Chapter of the Ohio Wesleyan Alumni Association and has served as President and in various other capacities in the Dynamic Networking Association. He has served the community as a coach in the West Hartford Youth Soccer League and as Assistant Cub master of Pack 145 in West Hartford. His interests include flying, boating and travel.